For the past four years, we have attended the Metal Roofing Conference, held at various locations around the US. This year’s conference was held at the Miami Airport Hotel. We had a jam-packed, but rewarding time, so today’s post will focus on the great things and knowledge we took home from this year’s conference. Ready? How do you pick your “favorite” things about a conference? There is so much that goes on during them that it really is difficult to pin-point a favorite aspect, but the thing we probably most enjoy from attending these conferences is the key speakers because they offer so much of their knowledge to the rest of us. What we also enjoy (maybe even more) is the vast amount of hands-on training we get and actually learning how to install and work with metal roofing on actual homes. This year, our favorite speaker was Louis Rondeau, who prefers to be called Lou. He’s really knowledgeable about metal roofing, which is a good thing because he is the National Technical Training Manager at Rheinzink America. He’s also a fourth generation roofer with 25 years of personal experience in metalsmithing, and he holds an MBA in Organizational Leadership. One thing I noticed at this year’s conference, that I found a bit odd was the amount of roofing companies that attended. Approximately 500 or so were invited to attend, but only two companies actually attended. Of those two companies, only one or two members were representing. I am thankful five of our guys attended the conference, because the amount of training we received is irrefutable. I mean, there was a mock-up of a roof and we had the chance to practice different ways of putting panels together and we also had the opportunity to work on different ventilation scenarios. It doesn’t get much more hands-on than that!I am thankful five of our guys attended the conference, because the amount of training we received is irrefutable, and it also helps to make us the best Miami roofer possible. This metal roofing conference is the only one of it’s kind in North America, which makes it a pretty big deal. At Istueta Roofing, we take pride in our work, because we take the time to fully train and educate our team members for every step of our process. 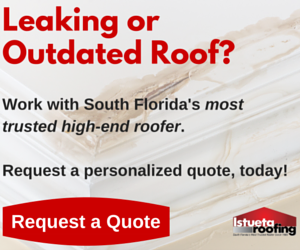 So we aren’t just confident we can do the job for you… we are expertly trained to do the job correctly.At Istueta Roofing, we take pride in our work, because we take the time to fully train and educate our team members for every step of our process, that’s why we’re the best Miami roofer around. If you are looking into new roofs, metal or otherwise, give us a call or visit our website. We would be happy to meet with you and discuss your options.